The recently completed Utilities Administration Building was awarded LEED Platinum in a ceremony today. We're quite excited about the designation, as speakers presented it as the first building in Colorado (and only the third in the country and fourth in the world) to be awarded Platinum under the new LEED v4 standard for new construction. Platinum was the City of Fort Collins' target from the inception of the project, and we were pleased to be able to work so closely with the City and RNL to meet that target. Congratulations, City of Fort Collins! And thank you for helping to lead the charge on sustainability! Showing entrances and flows of people and goods. 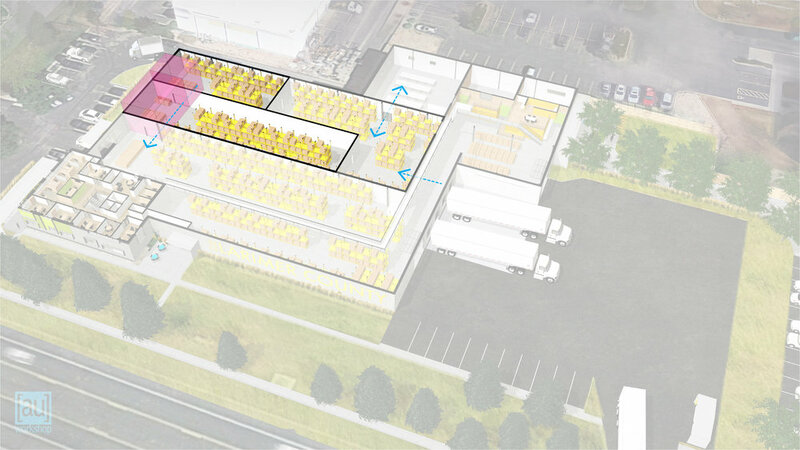 Showing the 1100% increase in cooler space and 340% increase in freezer space from the Blue Spruce facility (magenta boxes) and the direct access to the kitchen and food link areas. Showing the 275% increase in size over the Blue Spruce facility (magenta box) and improved access to the cooler, freezer, and food truck/mobile pantry deliveries. Showing the increased loading dock size an efficiency, food link access, and volunteer access catwalk above. Showing the 160% increase in work area over the Blue Spruce Facility, safe parking separated from truck traffic, and increased efficiency through much-needed meeting rooms and comfortable, collaborative work space. Showing the 420% increase in volunteer work area from the Blue Spruce facility, parking located safely away from truck traffic, and safe access to the offices via the catwalk. We've been working hard on the aforementioned design for the Food Bank of Larimer County (renovating an existing warehouse building to house their new headquarters and distribution center) and we're excited about the project, so we wanted to share a few images. Our solution first and foremost organizes a maze of programmatic and equipment relationship requirements that are necessary to maximize both employee and volunteer safety, efficiency, and comfort. At the same time, because we believe that good design does not have to be expensive and should be available to everyone, even non-profits, we also aimed to introduce some fun spaces into the pragmatism of the existing building. By keeping the vast majority of the existing enclosure and plumbing in place, but selectively demolishing elements to clean up the exterior and open up the interior, we are able to keep the project cost-effective while allowing plenty of room for future growth. The addition of several used shipping containers into the warehouse divides the space into rooms, while also providing rooms within the units themselves and a pop of industrial color. 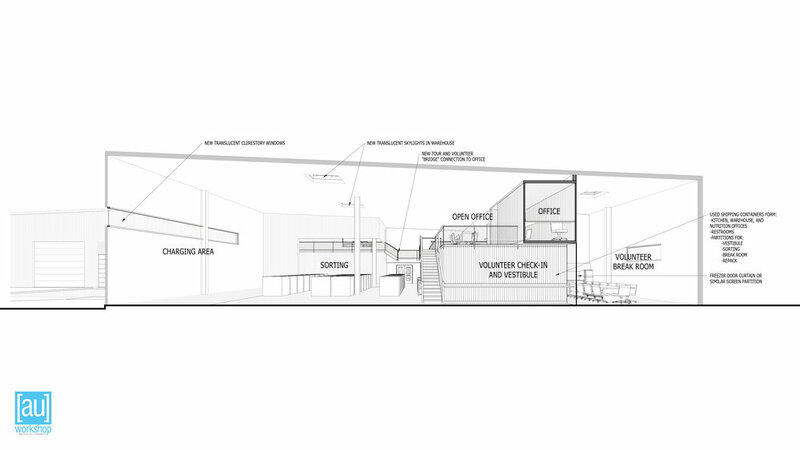 They also serve as a landing point for one of our favorite elements: a warehouse mezzanine bridge that allows volunteers to travel between portions of the building above the fray of forklift traffic. This bridge also allows for tours of the facility, providing views into the cooler, kitchen, and other areas. On the exterior, we have proposed a low-cost, extremely low-maintenance facade consisting of small opening chain link, paint, and stucco over the existing split-face CMU. A series of pre-engineered steel canopies create a village of welcoming portals, while subtly referencing the butler building construction of the warehouse itself. It's been lovely to work with such a great organization; their dedication and passion are truly remarkable. In addition to all of the fantastic things they do, the Food Bank has been working hard to raise the funds to make the project happen, so that they can continue providing an essential service to fill an ever-growing need. Please do visit their webpage and consider making a donation to help further a great cause. More images of the project are available at our project page. 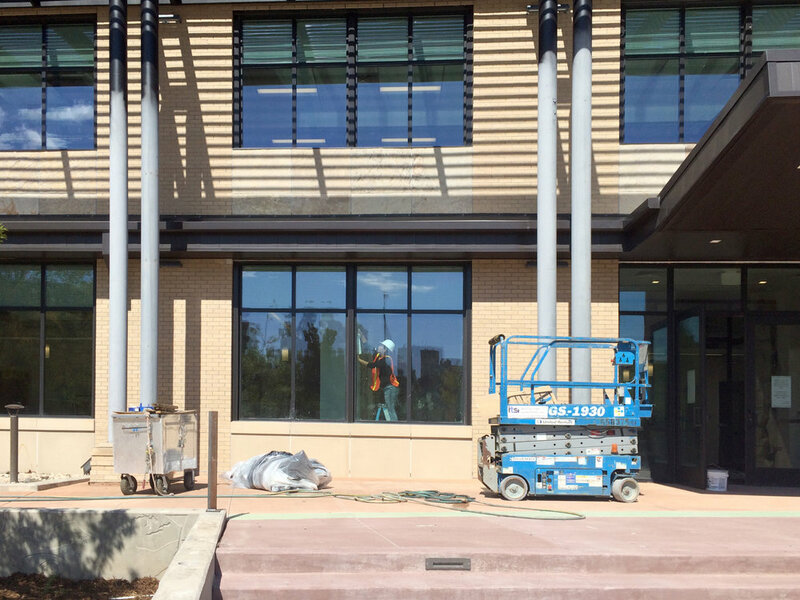 The City of Fort Collins Utilities Administration building is now complete! Please check out our project page for professional photos and more, and be sure to see our previous post for additional images. "Butterfly" Building Renovation Under Way! 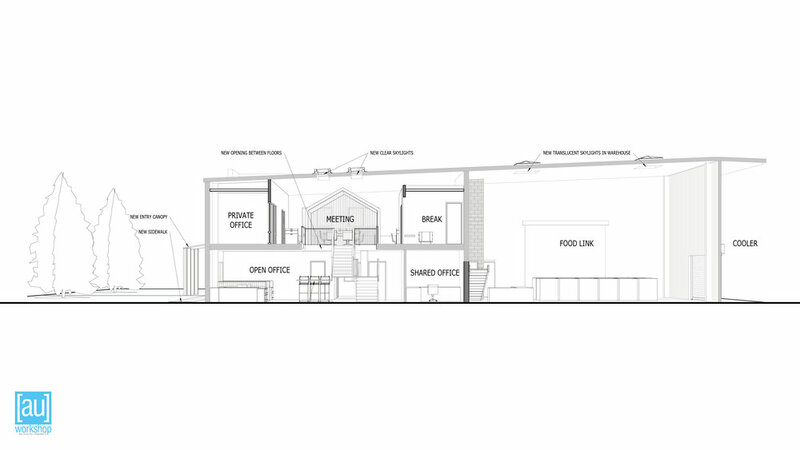 [au]workshop has designed a renovation for the historic Dairy Gold Creamery (located between Laporte and Howes Streets in Fort Collins) for a new coffee shop tenant. The building, a good local example of the Googie style of architecture, was carefully relocated slightly to the East in order to accommodate the new Utilities Administration Building, itself a collaboration between [au]workshop and RNL Design. Out-of date mechanical and electrical systems, lack of accessibility compliance, and the absence of restrooms and other services, dictated a complete interior renovation, with the goal of making it a lively tenant space. Working closely with the City of Fort Collins, we developed a plan that houses a customer sales space and seating, a limited commercial kitchen and an accessible restroom all in an area less than 400 square feet. Perspective of exterior paint and new sign. Office tour of work in progress! Work is now beginning on the renovation itself, and construction is expected to take approximately a month, so we'll post another update when it is completed. Utilities Administration Building Nearly Complete! 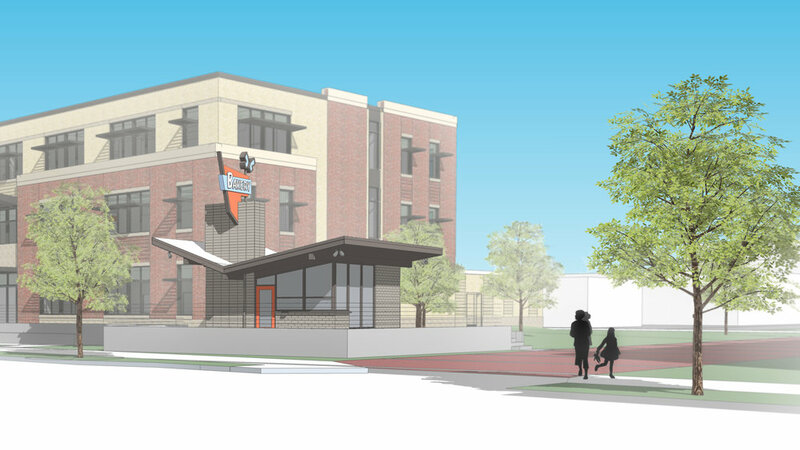 The City of Fort Collins Utilities Administration Building (UAB) at Laporte and Howes is wrapping up construction this week. We partnered with RNL Design for the project, and we're pleased to see its progress. Final touch-ups are being made this week, with the city scheduled to begin moving in shortly thereafter. The new facility houses some 112 open office spaces and a dozen private offices, along with training spaces and customer facilities, all designed to maximize natural light yet minimize glare. The mechanical and electrical systems, including rooftop solar and heat pumps, are also engineered to tie-in with future projects as the city develops a civic campus. Currently the project is on target to achieve LEED Platinum. Our office took a tour recently, so we thought we'd share a few photos (below). We'll be uploading professional photos (and possibly drone footage!) soon. Final interior touches and steel painting in-progress. Brick Facade with stained glass visible behind. Art wall showcasing the history of electric power by Chevo Studios. Stained glass in the stairwells by Creative Stained Glass Studio. Entry feature wall with Poudre River topography, by Chevo Studios. [au]workshop architects+urbanists has just been selected to design new offices, volunteer work spaces, a central kitchen and warehouses for the Food Bank for Larimer County. The new facilities will be located in an as-yet-to-be-announced location. We are more than pleased to be able to provide architectural services for this fine organization whose mission is to provide food to all in need through community partnerships and hunger relief programs. The Food Bank for Larimer County believes no one should be hungry and their dream is to deliver health, hope and humanity to stabilize the lives of their clients and build a vibrant community. They are a private non-profit organization and the only Feeding America clearinghouse for donated food in the county. Each year, the Food Bank for Larimer County provides food to nearly 36,000 people in need through community partnerships and hunger-relief programs. Visit their website for more information. Ground has been broken at the Desiderio Homes! The site has been cleared and the ground broken! We're very excited to see the project progress! Learn more about the Desiderio Homes (and their awesome site at the base of the Colorado Street bridge in Pasadena) here. To donate to or volunteer for the project, visit the San Gabriel Valley Habitat for Humanity.